00000080-putting-nanach-sticker-car.jpg‎ (500 × 375 pixels, file size: 127 KB, MIME type: image/jpeg). This image is also available in a larger size without the logo. To use any of the Zissil photo stock images and pictures for print media please contact us. 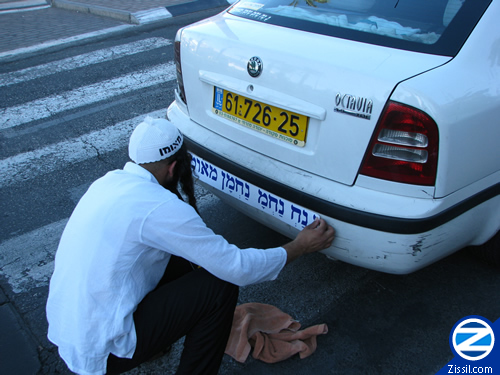 A follower of the Na Nach group putting a sticker containing the phrase Na Nach Nachma Nachman Meuman on a car. Nanachs will often do Hafatza at busy intersections and place Nanach stickers on cars as they slow down for a red traffic light.